Win Interactive Coding eBooks for Your Classroom! 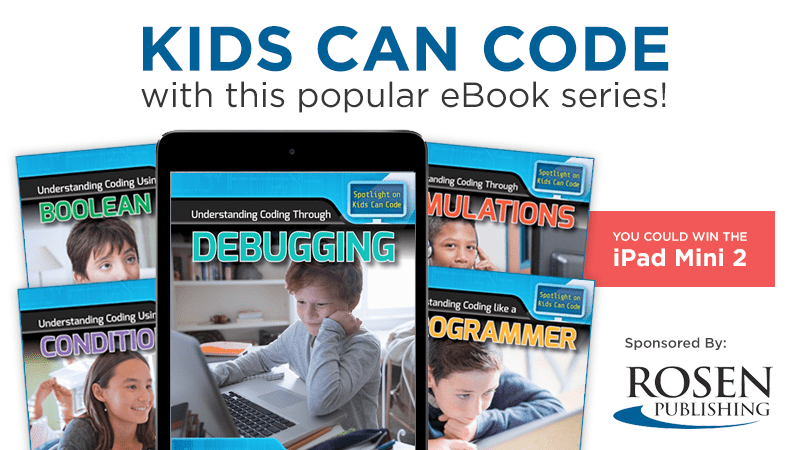 The Spotlight on Kids Can Code interactive eBook series can help you teach coding at any age! Sign up for a free trial here. It’s time to get your students coding, no matter what grade you teach! With this giveaway, you could win the interactive eBook series “Spotlight on Kids Can Code” from Rosen Publishing. With titles like Understanding Coding With Minecraft, these interactive eBooks make coding fun and easy for students. Grand-prize winners will receive a full set of this interactive eBook series, which features unlimited simultaneous access for your entire school building, as well as an iPad. No purchase necessary. Making a purchase will not increase your chances of winning. The promotion is open only to legal residents of the United States who at the time of entry are a) eighteen (18) years of age or older and b) currently employed full- or part-time as an educator by an accredited public or private K-12 school in the United States. WeAreTeachers is the official administrator of this program and Rosen is the Sponsor. Employees of WeAreTeachers or the Sponsor and their affiliated companies, subsidiaries, distributors, sales representatives, agents, advertising and promotional agencies, and the immediate families and household members (parent, spouse, child or sibling) of each are not eligible to participate. The Promotion is subject to all applicable federal, state, and local laws and regulations. All entries must be submitted using the online form by 11:59 p.m. on 4/3/17, Central Time. Winners will be selected by random drawing and announced on the WeAreTeachers website by 4/6/17. And check out all our other great contests that you can enter now! Enter to Win Your Very Own Classroom 3D Printer!